The Healing is Always Christ: The Rapture: Take Hold of Christ! Vicky Thomas' Postings AND Jeanie Windes' Dream & A Salvation Prayer! The Rapture: Take Hold of Christ! Vicky Thomas' Postings AND Jeanie Windes' Dream & A Salvation Prayer! There is much good that I could say about these two women of God- Christian ladies who are dear friends of mine. They are so important, and I am very thankful to them for sharing their hearts and gifts with us. Each one prays and studies the Bible, loves her Lord and family. Both Vicky and Jeanie are precious, and they spread the Good News, the Gospel of Christ Jesus, Who is the Living God, both Bread of Life and Living Water. Jeanie and Vicky are married to Christian men, are mothers and grandmothers- and wonderfully so, you can see the love of the LORD in their faces! I must quickly share how today's vitally important posting came about...how Almighty God orchestrates happenings for His will and greatness, for the goodness of His created ones, us. The unity of God's Spirit is incredible and magnificent! Meanwhile, Jeanie had seen a posting of mine recently that caused her to contact me. We had not seen each other in a while and wanted to catch up on each other's lives and our faith. When we met and talked over coffee that particular day, one of the last things Jeanie said to me was, "Oh, I had a dream about the Rapture, too." As we shared with one another, we had been discussing Godly dreams. Well, my mouth fell open a second time! I was astonished that now I was hearing from another Christian about the Rapture. God's timing was perfect, as usual... The two must come together, so here are Jeanie's dream and Vicky's blog postings...God bless you and enjoy, Dear Friends. a beautiful warm sunny day. No one was around me. I was walking alone. at all the little clouds that were gathering. They were beautiful white clouds that were swirling around and increasing in number and size. Suddenly I realized they were Angel wings and the sky was filled with Angels. Then the blue sky split open and all I could see was a brilliant Gold Light. Instantly my body started ascending into the air and I realized "this is the rapture." I saw other specks ascending around me and realized it was other people. I said, "Praise God, this is the rapture." I woke up feeling that this dream was God saying to me, "In your lifetime." The Rapture is the Truth of God in His Holy Word, the Bible. 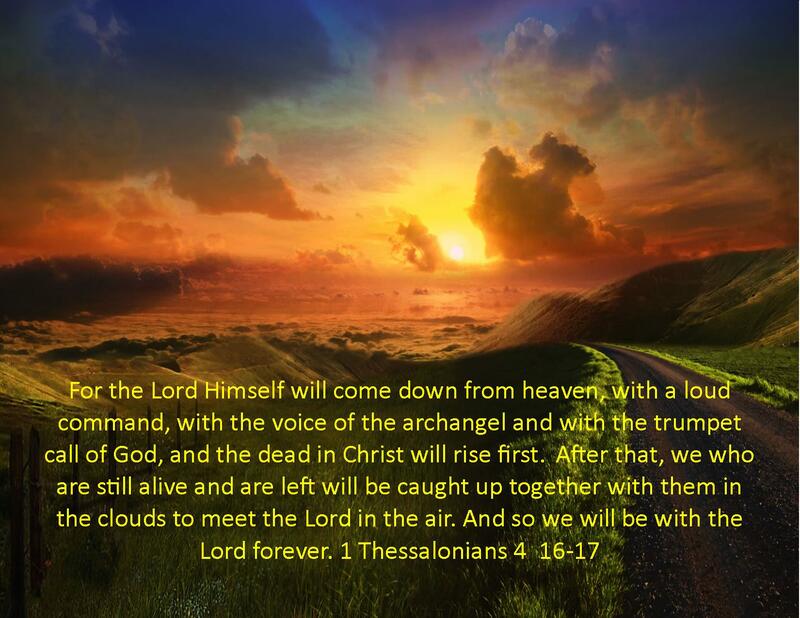 God's Biblical Promises to this point in time have all come true, and those still to be done will most certainly happen, including the Rapture, followed by the Tribulation and the whole of God's Plan to completion. The New Heaven and the New Earth will form, which is God's Kingdom for those who have believed in God the Father's Son, Christ Jesus. When Vicky and I talked last, we each had thought prior to the other's knowledge: "We want people to know that the Rapture is not a fairy tale. It is going to happen." Please, dear ones, be with those of us who have chosen Life in Christ; it is eternal. None of us wants our eternal life without God. ~~~Vicky's first in her series of three postings on the Rapture: Are You Ready for the Rapture? ~~~The second in the Rapture series: When Will the Rapture Occur? When you want to step over the line of faith to God, you can tell Him in your own words or pray this prayer, simply telling the Almighty that you believe in His Son, Jesus Christ- that He died on the cross for your sins and that you want to be with the LORD forever and ever. My husband Royce says that we make it so complicated about faith and trust in Christ and that it is simple. Yes, it is...if you are sincere, take that step now...you will be new in Christ, and you will never, ever regret asking Jesus into your heart as your Lord and Savior forever. I know I have fallen short when it comes to living the life that I should. In small and even big ways, I need Your complete redemption through Your Son, Jesus. I believe that He is the Savior and the Lord of Life, that He came to earth and is the only fully human and fully God Person ever. He died for me, was resurrected, and He arose to the right hand of the Father in Heaven; JESUS LIVES!!! After being seen by many people 40 days from His redeeming crucifixion- just for me. He took on the sin of everyone. I am sorry for the sin I have done. Thank You, God, for being my God! I want to follow you all the days of my Life and then go to Heaven one day to be with You and others who have believed in You, only. Vicky Thomas and Jeanie Windes!! !